to be the best we can be! Lehigh Valley’s Musical Director, Marilyn Block brings 40+ years barbershop experience to the stage. At the helm since October of 2013, under her direction LVC has won the third place award in their division at the Atlantic Bay Mountain Region 19 competitions two years in a row. Her history in barbershop is vast and varied, singing in the three time International Championship Ramapo Valley Chorus for over 20 years, the top 10 medalist Spirit of the Gulf in Florida, directing choruses in Region 15 and Region 19 of Sweet Adelines, and in multiple quartets, she has found “home” with the ladies of Lehigh Valley Chorus! In addition to her leadership of LVC, Marilyn is Associate Director of Region 15 Sweet Adeline’s current championship chorus, Liberty Oak Chorus. In “civilian life”, Marilyn lives in NJ and is the Controller for a Promotional Products Distributor. 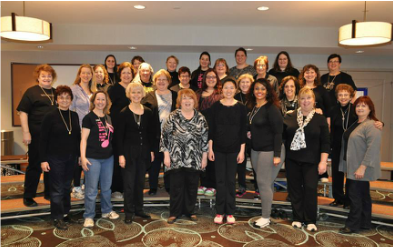 With the Lehigh Valley Chorus at annual competition, 2015 and pre-competition coaching event.